The English and native hunters did only want to leave camp at 11 o’clock explaining that the tigers are slower and easier to hunt at that hour. I did not agree with this late departure but followed the local customs. So we sent out our trackers and rifles with a number of elephants as an advance and followed half an hour later on the Nizam’s horses. These horses are strangely broken in, or in our understanding, really broken for use. On their haunches, these horses are used to be constantly assisted by the rider to make bella figura, so that they prance around without interruption and rear up, which is barely tolerable for longer periods of time. The tiger hunting area are low hilly ridges with bushes, with small ravines and valleys which remind me in character and view of the hills near Sopron. Already in Bombay we received at least three telegrams a day which informed us that the tiger has killed at a certain place and that therefore success was nearly a certainty. Thus we were very hopeful and rode with joyful anticipation, We had hardly ridden a few miles and were close to the hunting spot when various shikaris came running and, vividly gesticulating, informed our hunting master Mr. Stevens. When I asked him he told me that the chances were not as high as originally expected, as the report about the killed calf was erroneous. It had torn itself away and was still alive and kicking. Soon afterwards, natives arrived with whom the shikaris went into long consultation with the result that there was nothing to do today as the tiger had not killed anything and the best option was to return to camp. Bitterly disappointed by this message we breakfasted for comfort under a large tamarind and returned to camp by the same way we came under the certain expectation to find the tracked tiger. As the clock only announced two o’clock, I with my gentlemen rode across the land to add something to my ornithological collection and enrich the kitchen table. In the cultivated fields where we expected to certainly meet some chicken or jackals we strangely found no game, in contrast the shores of the many small ponds and wet rice paddies were rich in common snipes and sandpipers so that we could hand our cook quite a number of animals. Prior to our departure, I had had laid out a skinned sheep as bait near the native huts around our camp, so that I could, after our return to camp, kill within minutes 13 scavenger vultures (Neophron ginginianus) and 2 pariah kites (Milvus govinda). 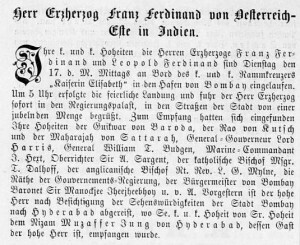 ANNO – on 22.01.1893 in Austria’s newspapers, Empress Elisabeth is currently sightseeing in Sevilla. The readers are informed that the Empress ate some pastry in the Café Suizo, famous for its chocolate. Given the extremely harsh dietary regimen of the Empress, that information must have been noteworthy. 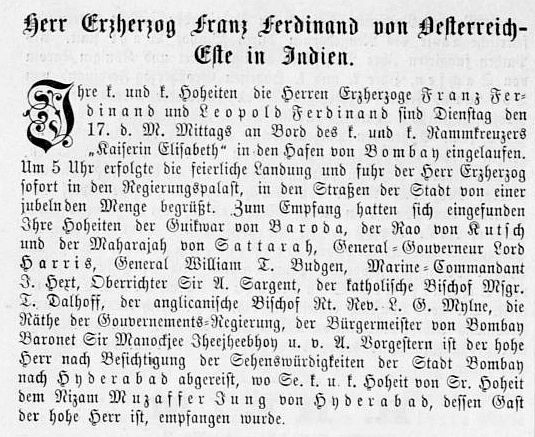 The Wiener Salonblatt carries a short report about Franz Ferdinand in India. Noteworthy is how Franz Ferdinand’s account completely ignores the presence of the black sheep, archduke Leopold Ferdinand who was finally recalled to be off Franz Ferdinand’s back. The k.u.k. Hof-Burgtheater is performing a tragedy by Grillparzer in the afternoon, „Sappho“, and a comedy in the evening „Der Störefried“, while the k.u.k Hof-Operntheater repeats once again its ballet combo in the afternoon and in the evening, it is time for Gounod’s opera „Margarethe (Faust)“. Dieser Beitrag wurde am 22. January 2018 von wordpressadmin in diary veröffentlicht. Schlagworte: hunting, India, January, Tandur.